I know a smartphone can do most anything these days, but the primary reason I own one remains making calls and sending texts — just like in the dumbphone days. 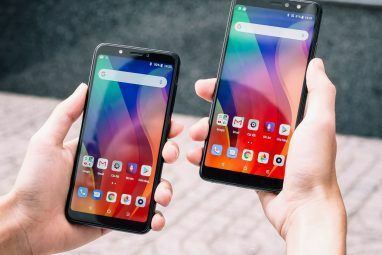 But while manufacturers go about cramming features into each new model Why Your Next Android Smartphone Should be Chinese Why Your Next Android Smartphone Should be Chinese For years, Chinese smartphones have gotten a bad reputation, but here's why you should really consider getting one now. Read More , sometimes they leave out the basics. How long did my last phone call last? Why do some phones not include a way to see this information out of the box? Fortunately, there are third-party apps available that can show you this information and more. Your carrier probably includes a mobile app that will show you how many minutes you used this month and the number of text messages you sent. Chances are they also divide this information by line, so you can see how much usage came from each device. Callistic goes much further. The app shows you how many minutes you’ve used this month, sure, but it also lists how much time was spent talking to each contact. 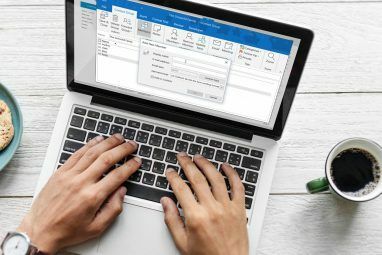 This is amusing for personal use, but it could have practical applications in the business world 4 Android Apps You Need to Manage Your Own Business 4 Android Apps You Need to Manage Your Own Business Your business is on the grow, you are on the go! How do you manage it all without being tied to the desk? Read More when you need to know how much time you spend on work-related calls. You can even dive in deeper, seeing how much of this time was spent on outgoing versus incoming calls. And if you’re not fond of numbers, you have your choice of graphs. Extending beyond calls, Callistics lets you see the number of text messages you’ve exchanged with each contact and how much data each of your apps have used. The latter option isn’t that different from functionality stock Android already provides How to Prevent Any App From Using Mobile Data on Android How to Prevent Any App From Using Mobile Data on Android If your apps use too much mobile data, try restricting background data on Android. Here's how to turn off data and save money. Read More , but it’s there in case your phone’s manufacturer did anything to bury this information. The app is free to use, but you need to go Pro to get unlimited access to all of the features and remove the ads. You can buy limited access for $1.25 per feature, or you can get everything for $3.25. Callistics, in covering more than just calls and presenting information using all those fancy graphs, might be more than you need — plus, you might not like it’s in-app purchases. 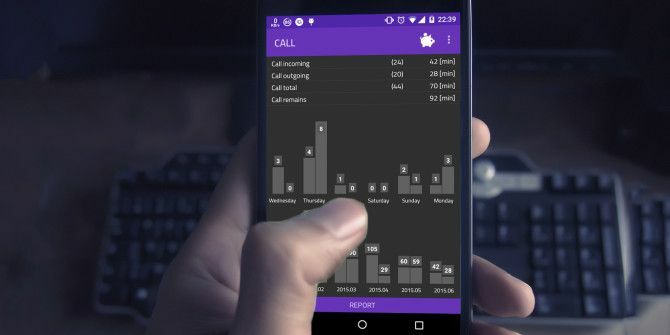 Call Duration Explorer is something much simpler, and it’s entirely free. Call Duration Explorer can show how many total calls you’ve placed, received, and missed, along with the total amount of time you’ve spent talking. Once that stops being interesting, you can tap on specific calls to see the pertinent details. For those conversations that happened many moons ago, you can search custom ranges that extend for longer than a single month. Now for the downside. Call Duration Explorer hasn’t received an update since 2014. The interface looks like something out of the Ice Cream Sandwich or Jelly Bean era of Android devices. It still works, but it’s going to look out of place alongside most modern apps. 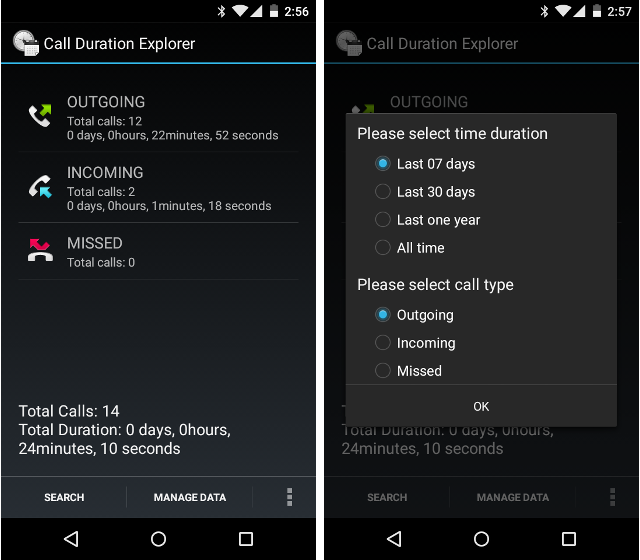 Call Duration Explorer doesn’t contain any in-app purchases. On the downside, it’s ad-supported, and you can’t get rid of them. Otherwise, the app is lightweight and snappy. I know that’s more than enough for some folks. Okay, maybe you can’t get over those looks. I understand. They’re a deal breaker for me too. I don’t want my software to be a perpetual reminder that everything eventually gets old. Life does that enough already. Call Message Data Counter is another option that attempts to embrace modern design guidelines. As for features, you get what you’d expect here. Call Message Data Counter monitors calls, text, and data usage (including WiFi). One nice addition is the ability to calculate the cost of each of your minutes, messages, and megabytes. And, again, you can view the information in graphs if need be. Call Message Data Counter is more complicated than the others on this list, but that also makes it more configurable. If the other choices are leaving you wanting more, this may be the route to go. Data & Call Plan is also easy on the eyes. It’s bright and colorful the way apps are these days, even though the appearance is more KitKat than Lollipop or Marshmallow. 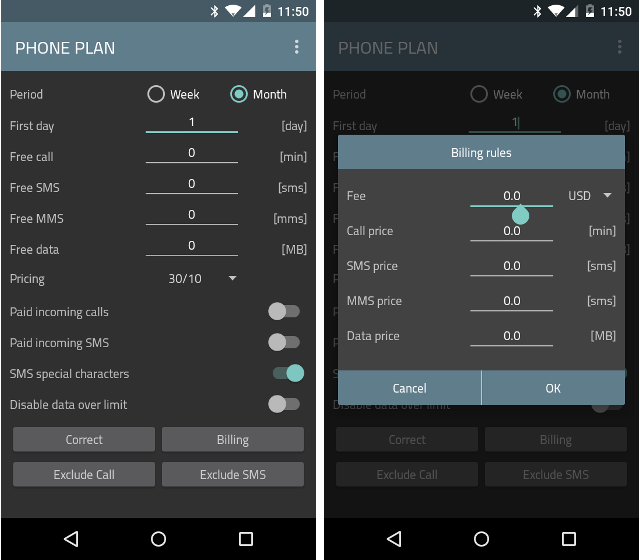 Data & Call Plan focuses more on your cellular usage than specific calls and texts, but you get a good look at how many conversations you’ve had this billing cycle. You can also keep up with which contacts you had these interactions with. There are a few inclusions here that have nothing to do with communicating. You can see graphs detailing your battery usage and screen-on time, for example. And you can view contacts saved to your device that don’t have an associated phone number. English is not the app’s primary language. Overall, the translation is adequate enough to use daily without typos or misspellings, but there are a few areas here and there where things read a bit off. Data & Call Plan is ad-supported out of the box, but you can remove those for 99 cents. For a little more than $2.00, you can get rid of ads and activate all premium features, like a widget that displays information on your homescreen. While the prior apps stop at presenting you with information, Call Timer lets you act on it. Rather than merely monitoring how much time you spend talking, you can limit your incoming and outgoing calls. 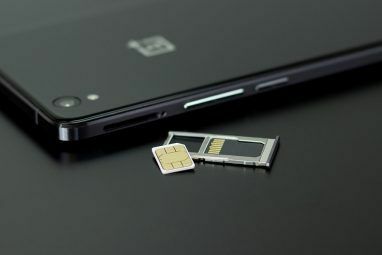 Specifically, the app can hang up calls after a certain amount of time has passed, saving you money if you use a plan where the first few minutes of a call are free. I haven’t encountered such a plan in the US, but they’re out there in other parts of the world How to Make Free Calls to Any U.S. Number From Anywhere How to Make Free Calls to Any U.S. Number From Anywhere There's a free way to make calls to the U.S. and Canada from anywhere and all you need is a Google Voice account. Read More . If automatically hanging up or redialing sounds too intrusive, you can set up alarms to alert you when you’re approaching your limit. Call Timer also comes with the ability to monitor whatever aspects of your usage your phone or carrier don’t provide out of the box. There’s a Pro version for $1.99 that adds additional features like advanced caller ID, but the free version works just fine. To me, it seems our smartphones may be smarter devices, but they aren’t necessarily smarter phones. Core functionality and reliability available in the flip phones of yesteryear appear to have turned into secondary priorities. Fortunately alternative apps leave us with options. You don’t have to settle for supplementing your existing dialer and contact apps either — you can replace them entirely What Is the Best Contacts & Dialer App for Android? What Is the Best Contacts & Dialer App for Android? You don't have to settle for your phone's built-in contacts and dialer apps. Read More . How often do you talk on the phone these days? Does your phone not tell you? You don’t have to call us to share your experience. Speak up in the comments below! Explore more about: Call Management, Contact Management. I am using LENOVO A6000 mobile and I am getting Incall UI not responding messages when incoming call is there. Please adv. I am using Call Message Data Counter Pro since a couple of years. Value for the money. We can even customize our tariff plan to give a cost wise output as well as usage and "top" lists. Recently the dev revamped the UI, it's cool. Wait! You mean I can make telephone calls on my handheld computer? I have a $30 T-Mobile plan with 100 minutes of voice calls (also unlimited text and 5GB of data) so I rarely call people. Text is much more convenient and provides a history of what as well as who.